Designer Tinker Hatfield announced at the Jordan Brand Flight Lab in New Orleans that the self-tying laces worn by Marty McFly in the 1989 movie “Back to the Future II” will arrive in 2015. According to the blogpost of ShawnKnight, self-tying laces will arrive in 2015 which just happens to be the exact year that McFly and Doc Brown visited in the movie. Delaying the laces until 2015 could be a deliberate move on Nike’s part to drum up even more interest but that’s only speculation at this point. In 2010, Nike applied for a patent for automatically lacing trainers, which provides a set of straps that can be opened and closed automatically to switch between a loosened and tightened position of the upper. The system also includes an automatic ankle cinching system that will automatically adjust an ankle portion of the upper. 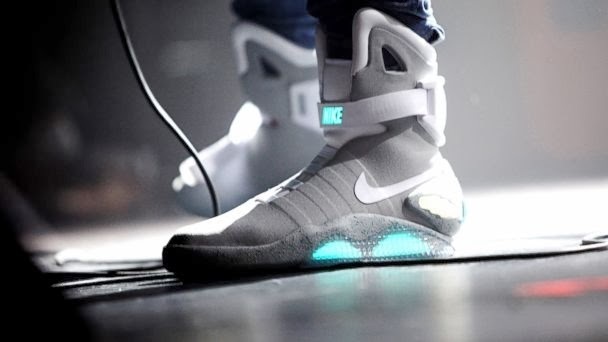 After a year, Nike launched Nike Air Mag, a replica of the pair worn by Marty McFly and inspired by the film“Back To The Future”. A total of 1,500 pairs were sold. The revenue from the sales of the sneakers, which reached almost $6 million, went directly to Michael J. Fox Foundation, which is dedicated to the research and development of permanent treatment for Parkinson’s disease.